Matt the Mac Jedi drew up this image after reading the story about my recent altercation with a disappointed theme downloader. 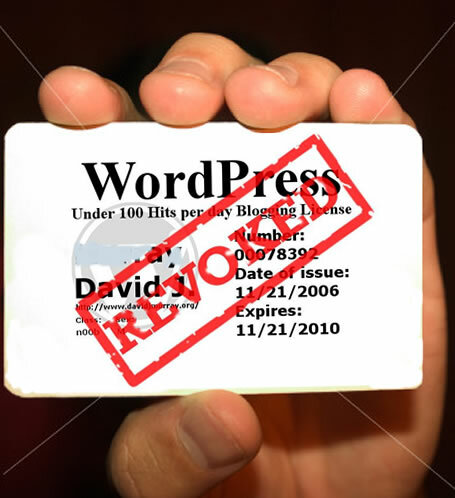 Apparently, having ascertained that said blogger lacked a full understanding of communication on the WWW, not to mention what open-source code is, it was determined that his license to blog needed to be revoked. I still can’t stop laughing. After a recent post that included a couple of small .zip files for download, I decided I might want to track how many times my files had been downloaded. A Google search for ‘wordpress download monitor plugin’ yielded the aptly named WordPress Download Monitor plugin. At first glance, it seemed as if I would need to re-upload anything I wanted to count downloads on, which seemed like a pain, but I figured if I decided later I had to have a count, it would just be more downloads to re-upload, so I decided to install it and try it out. The install was typical–upload to your plugins directory and go activate it in the admin section of your site. The first clue that I was in for a treat is right there in the description of the plugin–it tells you where its options page is. Once in the management area, I immediately noticed that you can either add an Existing or a New download to track. Adding an existing download was as simple as pointing the plugin to the URL and giving it a title. Download Monitor then offers 4 simple ways to integrate the plugin into your post using simple bracket tags and the unique ID of the download. You can specify whether to show a link to the download and a count, just a count, or just the download. There’s also some handy PHP functions that you can use to show your top downloads, etc. All in all, this seems to be a really great plugin. I was worried at first that I might have to lose a bunch of time re-uploading stuff, but obviously that eventuality was accounted for by Mike Jolley, the brains behind Download Monitor. Other than that, it works for keeping a count, and it’s easy to use. The only thing I might think to improve is that some sort of download image could be added as an option, much like the really nice one on the plugin’s homepage. That will bring more attention to the download and separate it from the general flow of the story. Other than that, I’m a happy camper. It wasn’t as bad as I thought it might be to upgrade from 2.0.4, and I’m a big fan of the new autosave feature.